From bestselling author Natalie Standiford, an amazing, touching story of two friends navigating the dark waters of their senior year. New to town, Beatrice is expecting her new best friend to be one of the girls she meets on the first day. But instead, the alphabet conspires to seat her next to Jonah, aka Ghost Boy, a quiet loner who hasn’t made a new friend since third grade. Something about him, though, gets to Bea, and soon they form an unexpected friendship. It’s not romance, exactly – but it’s definitely love. Still, Bea can’t quite dispel Jonah’s gloom and doom – and as she finds out his family history, she understands why. Can Bea help Jonah? Or is he destined to vanish? All of the books I’ve ever rated five stars are on the column to the right >, and HOW TO SAY GOODBYE IN ROBOT is one of them. Reading this book again because I haven’t in awhile, I was reminded of just how amazing it is. This book truly never ceases to shock, astound and amaze me at every turn. 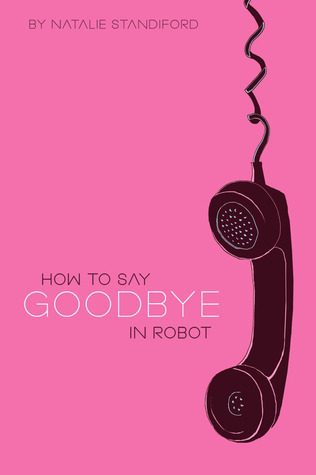 The thing about HOW TO SAY GOODBYE IN ROBOT is that it is straight up contemporary. There is seriously no other way to phrase it, and if you don’t love slow-paced books, then this will probably not be the best book for you to read. Keyword: probably. 3/4 of HOW TO SAY GOODBYE IN ROBOT is pretty slow. Bea and Jonah are quite unlike many YA main characters, and their story is an unusual one. Bea is blunt, crude and pretty quiet, but that makes her hilarious on many occasions. Jonah is extremely quiet and a loner by all definitions. Both of them can be extremely awkward at times. Their scene isn’t partying and living the high school popularity scene, but rather listening to the radio in the middle of the night, breaking into hospitals to see people they thought were dead and going out of town to have fun on their own on homecoming night. Oh yes, and one more thing I should tell you. But the thing is, this book is about a relationship much more complex and deep than that. They go to and beyond the limits of friendship and the way that their relationship blossoms over the course of this book, despite the baggage on each of them, is amazing. Read it. Just read it. I’m Going to BEA 16!